Opensource Obscure, "Chromutate." Photo by Torley Linden, 2009. © Some rights reserved. Artificial agency refers to the facility with which software agents can be embedded in virtual worlds. Because the virtual world is itself a complex program, it is relatively easy to introduce into it forms of artificial life and artificial intelligence as responsive and even evolving forms of aesthetic expression. Wizard Gynoid, "E8 Polytope," 2010. © All rights reserved. The perceptually immersive 3D environment reacts dynamically to the presence of visitors and respond to their actions. The underlying code opens a space of possibilities, and the visitors, sometimes involuntarily, shape the actual manifestation of the manifold of these possibilities. 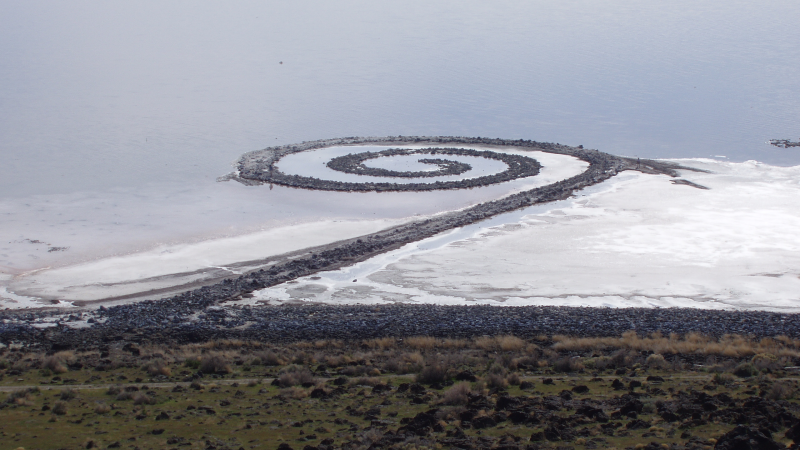 Selavy Oh paid homage to sculptor Robert Smithson’s Spiral Jetty, a real-life earthen sculpture constructed in 1970, by erasing it — à la Robert Rauschenberg’s Erased de Kooning. erasing the spiral consists of scripted terraforming covering almost the whole area of the art simulator, East of Odyssey, in the virtual world of Second Life. A spiral slowly emerges out of the virtual water, [while] white spheres cover the ground like pearls, structuring the ground and [reminiscent] of the salt crystals in Smithson’s work. And suddenly, like a splash, a huge wave consisting of virtual ground forms and propagates over the water, erasing the subtle traces of the spiral. Then the cycle recommences and the spiral is slowly rebuilding. In my previous post, I included Mab MacMoragh’s machinima of Selavy Oh’s current installation, ménage à trois at Brooklyn is Watching, an ongoing collaboration between artists and various art communities in Second Life. I twice encountered Selavy Oh’s performing autobots, including at Last Exit – Ars Virtua by Selavy and Qiezli Hixantapo. ménage à trois is an empty room except for three semi-cognizant, artificial beings and an intermixed text chat in French and English. I could see the interior of the room from the outside as the bots moved from corner to corner. Later I learned that the French text chat was from Charles Baudelaire’s volume of French poetry, Les Fleurs du Mal. The English chatter came from an interventionist text-bot by Sowa Mai and Banrion Constantine. My interview with Selavy further clarified what I had experienced. Selavy Oh, "ménage à trois,' 2010. Photo by Arahan Claveau. © All rights reserved. Nettrice Gaskins: So. Tell me about your current work, ménage à trois. Selavy Oh: Ok, so first: the English text is not part of the work but I don’t mind. It’s always like that here at BiW. Other people comment by placing their work here. The idea was, anyway, to interfere. NG: So your initial intention was not to have interference? SO: Not from chatting prims but from visitors. It would be very easy to filter out all other chat but I didn’t. NG: Why is this work significant to you? SO: I had a piece in mind which would use automated performers doing simple things. One of my topics is the space. Exploring it. Navigating it. Measuring it. That is what they do with the square as a basic unit. They always walk from one corner to the other. You have 4 corners and 3 bots. NG: What do they mean, these autobots? I find them entertaining. SO: They are what actors in a performance would be and of course the similarity is important. By choosing the same shape, that of an avatar, it is easier to identify with the bots, to think about what is happening in the space. When you walk or teleport around, there is this visualization. Is this a conversation or is it three separate talks? We don’ t even know who’s telling what. SO: There is a performance by Bruce Naumann called, Walking in an Exaggerated Manner Around the Perimeter of a Square. Nauman’s work deals a lot with space and body. Also, there’s a work by Samuel Beckett called, Quadrat I and II, which I discovered after I did ménage à trois. NG: How long did it take to create this work? What did it entail? SO: The walls took me not very long. That’s HTML on a prim. It took me quite some time to get into the coding of the bot software. I used Linden scripting together with a modified client software based on the libopenmetaverse. Not much. Most of it already existed from a library that is freely available. There are only a few artists in SL using bots that I know of, including Mosmax Hax and Gazira Babeli. However, the technical details are not important. What is most important is what you see. NG: So what do you want the Art21 audience to know about you/your work? SO: They should think of a virtual world as another form of medium. Someone started to use video, to make art with it and now video art is widely accepted. Now we are using something new. Glyph Graves, "Total Wind Sculpture," 2009. Photo by the author. © Some rights reserved. I also interviewed SL artist Glyph Graves, a former real-life scientist from Sydney, Australia, at the location of Entropy, as part of Through the Virtual Looking Glass. His installation consists of four sculptures situated on hills at the source of rivers that flow into a central basin. There is a tree near the center of this basin. Whispering into the tree causes the sculptures to melt and fragment, changing shape, color, and texture. The fragments flow along the rivers to the central basin, where they form an entrotopic swirling pattern. By focusing my SL camera on one of the fragments, I was able to follow the flow in and out of the central basin where plants went through life cycles, from birth to death. This experience was quite beautiful and very meditative. As well as the normal digital tools of graphic and 3D modeling programs, I also freely make use of Linden Scripting Language as both my chisel and my paintbrush. I’m constantly in a state of wonder (and occasionally, despair) at the depth and the dimensionality that’s available for the art of Second Life. I’ve been a fan of Glyph Graves’s work since I encountered his Total Wind Sculpture at Brooklyn is Watching last summer. We met right before he de-installed Incomplete Recollection, an “eclectic” selection of works from his SL inventory. This historical, virtual 3D build consisted of sections of older works, including Wind Sculpture, Strangers Also Dance, and The Transmutation of Tears. Glyph Graves: This work is a sort of grab bag from my inventory from the last 3 years. Nettrice Gaskins: Is there anything here of particular significance as far as your trajectory? GG: I like Organic Recurve because it encompasses a lot of things and together with the gallery. It shows a lot of what I do. NG: Does this react based on the avatar’s movements? GG: Yes, but that’s not the main part of the piece. Touch the objects a few times and it will start going by itself. It’s sort of like cellular automata. NG: Immersion, movement, and interaction. GG: Not really. In a way it has its own life that needs your interaction but it is not totally dependant on you. If you move it breaks up the pattern and stops playing the sound. Each time the pattern of sound and colour is different. The melodies are unique each time. It interacts not just with you but also with each other. If you touch it, you “disturb” one element and the other elements notice the disturbance and then in turn get “disturbed.” You can interact in various ways. NG: A-ha. I just had a breakthrough moment! By clicking on several floating 3D objects, each responded to being “touched” by changing in color, texture, and playing notes. Sound was generated note by note to create a harmonious score accompanying the movement (or dancing) of the objects. I recognized the musical patterns and saw the “automata” which refers to objects that are relatively self-operating and capable of performing multiple complex movements. Glyph was inspired by the serendipity of creating one work and immediately seeing different possibilities for a new virtual art form, blending visual elements with artificiality. Glyph showed me Urban Renewal, a unique virtual art gallery where human-driven avatars bring to the viewing all of their preconceived labels about art. The installation has nine levels and represents how people view art differently depending on their background, subculture, etc. In Urban Renewal, the gallery is the art. Our journey ended with Strangers Also Dance, an exploration of how people deal with difference, and The Transmutation of Tears which explored the possibility of transforming hopes and dreams into something else. AM Radio, "Surface," 2010. Photo and graffiti tag by author. © Some rights reserved. I make highly-complex, mathematically precise works of such symmetry and beauty that my creations are within the context of a sculptural work of art. My latest work is a complex two-dimensional projection of an eight-dimensional object. This geometric object is then brought to life with kaleidoscopic colors and patterns playing in the object to a musical background. To accomplish such things, we have to do some fairly complex scripting. My most complex work can be found on the Reaction Grid, an Open Simulator similar to Second Life. treet.tv did a feature on Reaction Grid recently and spent about ten minutes at my region and my build. You can jump to it by going to the 17:30 minute point. Register a user name and password for Reaction Grid. Download and install the Hippo open sim viewer or the Imprudence open sim viewer. Log into Reaction Grid by choosing the grid from the Grid drill down menu. Once logged-in, search on the Map for the “Wizzy” sim and teleport there. Chromutate is an interactive, virtual 3D installation by Opensource Obscure that deals with SL physics, reflexive architecture, and HTTP-in LSL. Visitors can change the colors of the virtual 3D structures, make objects appear, and send in-world messages from an external webpage. The installation reacts to the presence of avatars. AM Radio’s Surface allows visitors to create graffiti made public on Flickr and displayed in virtual worlds. Selavy Oh links her virtual art to external websites and uses online social media such as blogs or photo-sharing sites like Flickr. All of their art responds to user input and extends the capabilities of the Web 2.0 platform. Great article Nettrice, well researched and thorough, keep up the good work. Thanks Sowa! Lot’s to write about this time of year. I enjoyed finding all those references to RL artists, esp. Rauschenberg’s story about meeting de Kooning. I shared it with my students.